just from your smartphones android you can now Monitor your baby, pet, home, business, traffic, and weather remotely and securely. tinyCam Monitor provides best value to customers. download it now to get more features in future updates for free! H.264 codec (SW and HW) support for FOSCAM HD models (FI9821W, FI9826W, FI9831P, etc.). MPEG4/H264/H265 for many cams via RTSP protocol. 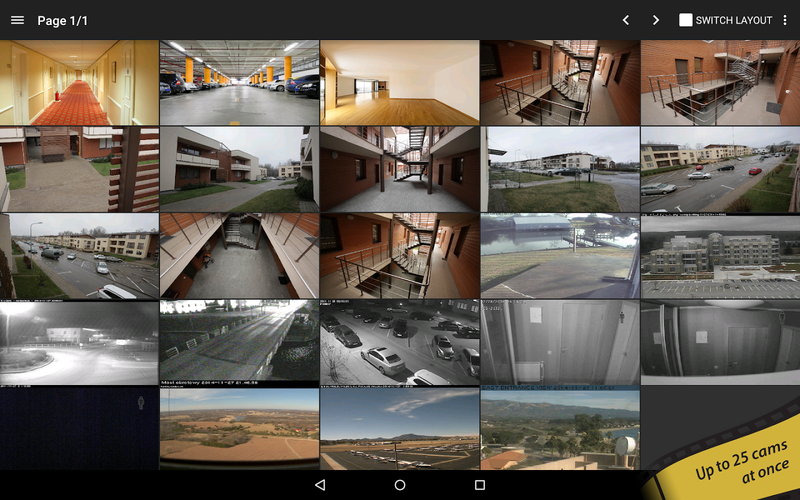 ONVIF Profile S 5,000+ cameras support. M-JPEG devices support of all major vendors (150+). 2-way audio (talking and listening) for Amcrest, Axis, FOSCAM, Apexis, Loftek, Mobotix, Tenvis, Wanscam, Wansview, Hikvision, INSTAR, upCam, and more on the way! 1-way audio (listening) for D-Link, Edimax, Panasonic, SONY, Sharx Security, TRENDnet, Y-cam, Sricam (selective models). SSL support (HTTPS protocol) for secured monitoring and encrypting credentials (digest authentication). Control PTZ (pan-tilt-zoom) enabled devices, i.e. Pixord, Vivotek. 24/7 MP4 video recording (Android 4.3+) on local storage/SD card and JPEGs recording to the cloud (Dropbox, Google Drive, Microsoft OneDrive, Amazon Cloud Drive) and FTP/FTPS server. Import/export settings to SD card or cloud service. Support for any USB/laptop cams through 3d party software for PC/Mac (see FAQ).